On a trip to Paris we learned the importance of buying a city pass. The line for the Louvre was impossibly long, and we got to go ahead of everyone and right in. Lesson learned right there: always look for a city pass. Our trip to Florence was no different. I knew I wanted to see David, and that everyone else would too. 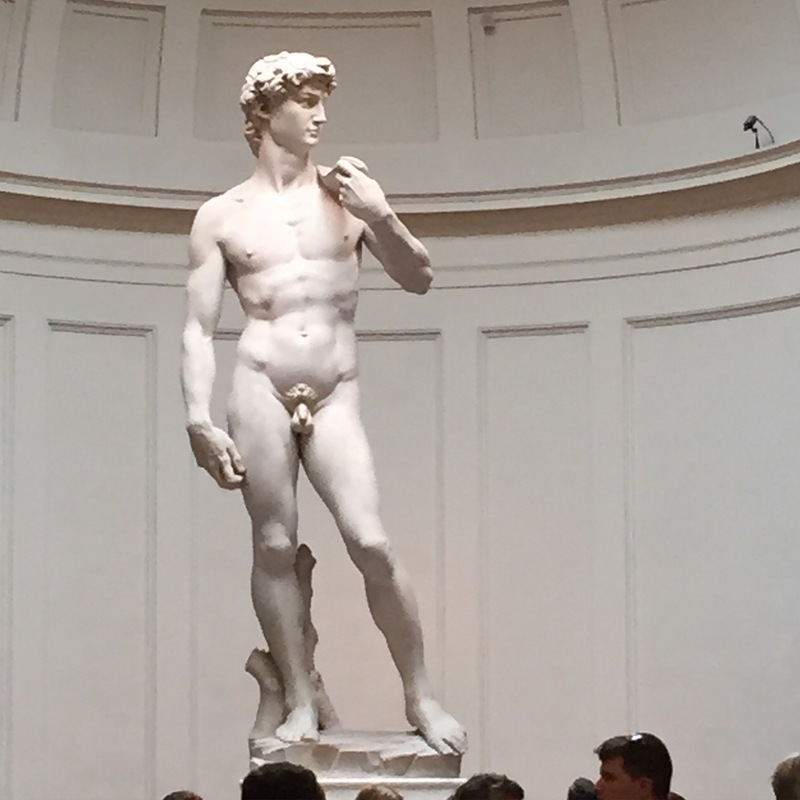 I assumed the line for the Galleria dell Accademia, where David lives, would be really long, so I searched the trusty internet and found the FirenzeCard. 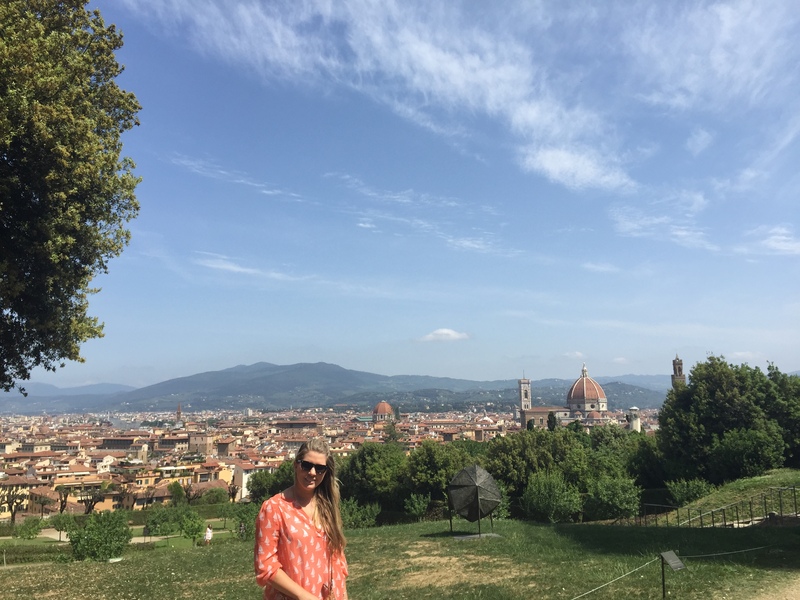 It’s 72 Euros (which was about $80 when we bought it) and covered the major museums and gardens in Florence, as well as two days of public transportation. It’s good for 72 hours and for one admission per place. The best part? It has it’s own entrance at most major places. 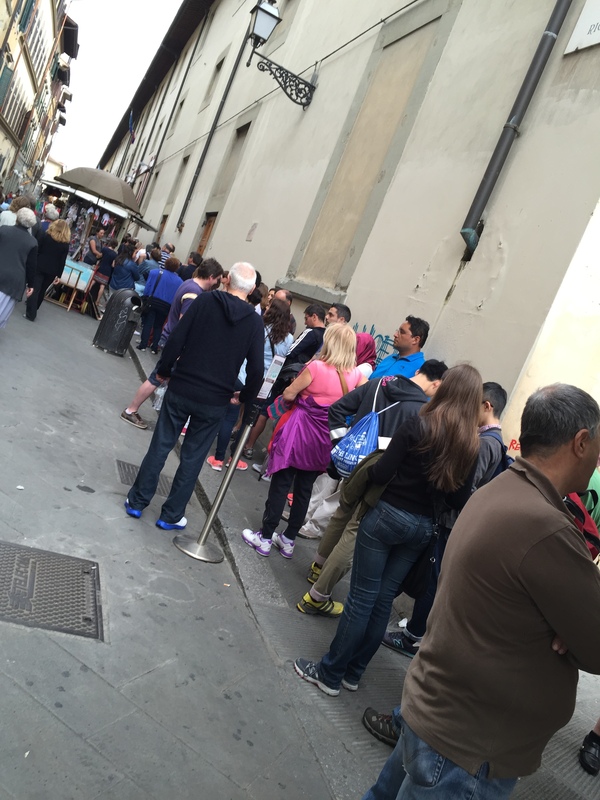 The line for the Galleria dell Accademia that we didn’t have to wait in. We walked right by and in to see David. The pass also gets you in to the Duomo. But be careful, there are many lines for different areas. Make sure you are in the line you want to be in. I accidently got in line to climb to the top of the Duomo. 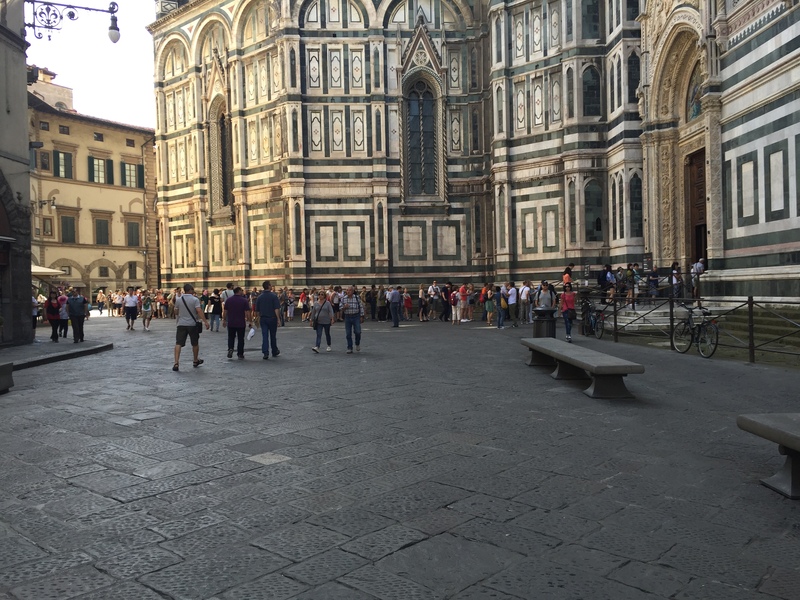 Yes, my scaredy-cat, claustrophobic, acrophobic self, and my equally acrophobic Husband got in line to climb the Duomo. The worst part? You can’t go back out once you’re in! So we had to climb all the stairs, the spiral staircases, and walk along the catwalks of the dome. I cried a little, I sweat so much I looked like I showered (and had to shower again when we finally got out) and nearly had a full blown panic attack. AND I DIDN’T HAVE MY XANAX! I can’t remember ever being so terrified in my life. But I survived, and I didn’t have to wait in line to do it. The line that I didn’t wait in at the Duomo. Also, the gorgeous, amazing Duomo. We also skipped the long line at the Museo di Palazzo Vecchio. It’s a gorgeous mansion with an amazing garden. But the best part is the view. You won’t see me waiting in this line! The view from the Museo di Palazzo Vecchio. 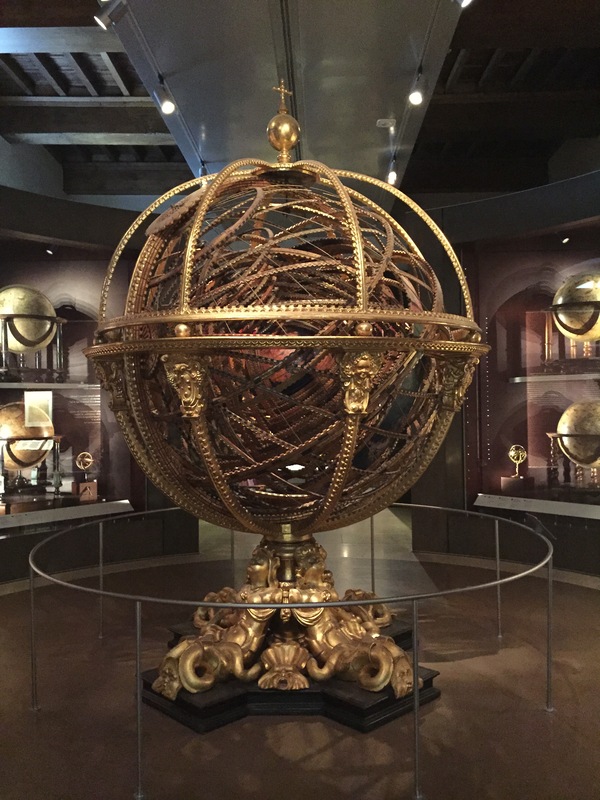 One of the most surprising parts was the Galileo Museum. We had no idea it was there and we are so glad we went. It was super interesting. 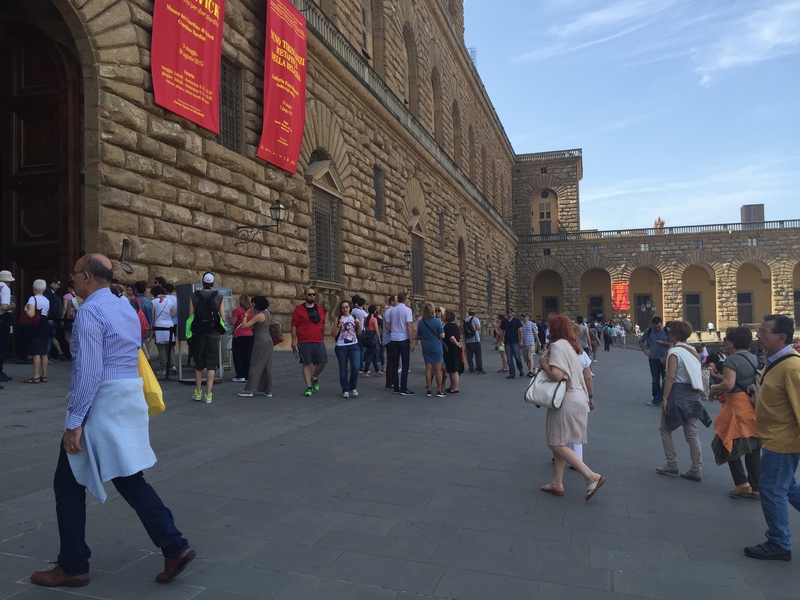 So if you are planning to go to any of the over 60 museums in Florence, you absolutely need to buy the Firenzepass. It will save you so much time and stress! Brilliant, we’re so glad you truly benefited from the line-skipping Firenzecard. And found the Galileo museum, which is really cool. Congrats on keeping your calm in the tight spaces of the Duomo climb, too! Thanks! What a fabulous addition to my trip the Firenze card was. Really made a difference. Thank you!